I ordered a DM-15CC with the aluminum case, rather than the DM-15 Silver Edition – decided that I didn’t need the titanium case, and it was a good way to save some cash. For the record, the SwissMicros site says that the Silver Edition’s upgrades are the titanium case, a “new keypad design” (although two owners of the Silver Edition mentioned over on the MoHPC Forum that the keyboards have not changed significantly), and a slim LCD font. I also ordered the leather flip case. We’ll start with the packaging. The box was surprisingly large, although quite thin, relative to the size of the calculator. Calculator was shipped in a neoprene (or similar material) pouch, in a plastic bag, with a second plastic bag containing the flip case. Both bags were taped to the inside of the box using double-stick tape. After unpackaging the calculator, I went ahead and fired it up. My calculator shipped with firmware DM15 M1B V13, slim font (despite not being the Silver Edition), so you don’t need to get a Silver Edition to get the slim font (although, even if you own an earlier model, the slim font firmware is available for download). 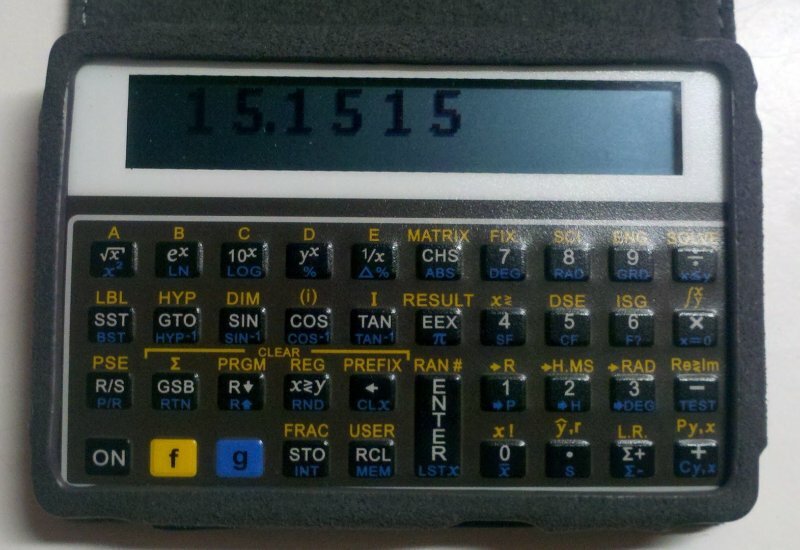 At its heart, this calculator is an emulator of the HP-15C (running on an ARM processor, although a different family from what HP is using in the ARM-based current-production 12C and the 15C Limited Edition), and therefore has largely the same feature set and user interface as a real 15C. However, SwissMicros has taken advantage of the fact that they’re using modern hardware and a graphic LCD (instead of a 7 segment LCD with dedicated annunciators) to make a few improvements to the capabilities and user interface of the calculator. Due to having much more available memory, the DM-15C ships with firmware that provides 230 registers of available memory to the emulator (on an HP calculator, a register is 7 bytes, or 14 nibbles/digits). However, for compatibility reasons, SwissMicros offers firmware with either 65 registers (same as a real 15C) or 129 registers. The calculator has a USB to serial adapter chip on-board, which is used for connectivity to the serial console (which is primarily used for backing up and restoring the calculator’s memory) as well as reflashing the firmware. The graphic LCD is used to good effect on this calculator – the most noticeable thing is that everything is displayed using bitmap fonts, rather than with the limitations of a 7 segment display. However, this does mean that the annunciators look rather ugly, due to the low resolution. An annunciator is added to the left side of the display, however, for commands that request additional input after issuing the command (however, LBL appears to not use it – maybe a future firmware release will fix this). A few additional configuration features are available – LCD contrast (here there be dragons – it is VERY easy to take LCD contrast out of range quickly, and not be able to see what you’re doing to fix it! ), CPU speed (12 or 48 MHz – I’m running mine at 12 MHz), and which font is in use (on the DM-15C, there’s two fonts, one that tries to simulate the 7-segment display, and one bitmap font depending on firmware, the other calculators have both bitmap fonts as more space is available). I wish there were a facility to do user-designed fonts, but that’s not at all critical. Let’s get this out of the way right now – this is not a mass-produced product. This is a low-volume product made by fans of HP’s calculators, and as such, it does have a bit of a DIY feel to it. That also explains the price, really. Considering that, though, it looks great. As I mentioned, the keyboard has extremely high key force. Also, the calculator has a noticeable key delay (and it’s even worse in 12 MHz mode, as far as I can tell), causing some missed keystrokes. However, it is quite tactile, and also has good auditory feedback. Overall, the keyboard is mediocre, I’d say. Far from the worst calculator keyboard out there, but not exactly good. And, it can probably be partially fixed in software. Like I said earlier, and as you can clearly see, the display has a rather poor contrast ratio. The picture does make it look worse than it actually is (the lede image is somewhat more representative), but still, it’s not good. The contrast is adjustable (CHS-ON, then + and – do small adjustments (on the first number in the display), ∑+ and 3 do major adjustments (the second number in the display)), but here there be dragons – by default, the calculator comes with the contrast set to 00-5. 00-4 is so faint that you can barely read it, much over 00-6 is so dark you can barely read it, and going any further, you may not be able to read the screen at all. I’m using 12-4, for what it’s worth. Really, some firmware work should be done here to improve the user interface (why are the ranges implemented like separate ranges, when they have massive overlap? ), and lock out useless modes. I did also notice a speck of dust under the display, but I was able to peel the top membrane back, and get the dust out. 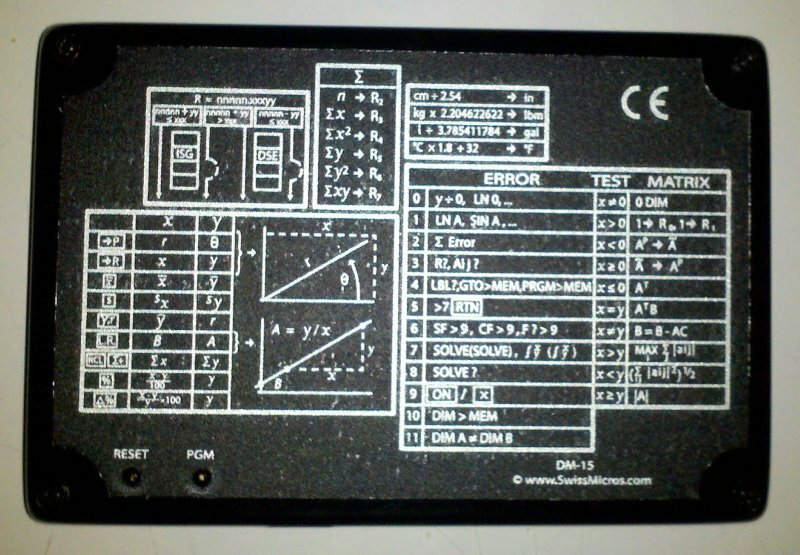 As far as the design of the calculator goes, earlier versions of the DM-15CC used a PCB sandwich style construction, as seen in this YouTube video of a preproduction sample – essentially, a thick middle PCB with no copper or silkscreen layers was used as the chassis, with a front PCB carrying all of the electronics, and a rear PCB as the back. 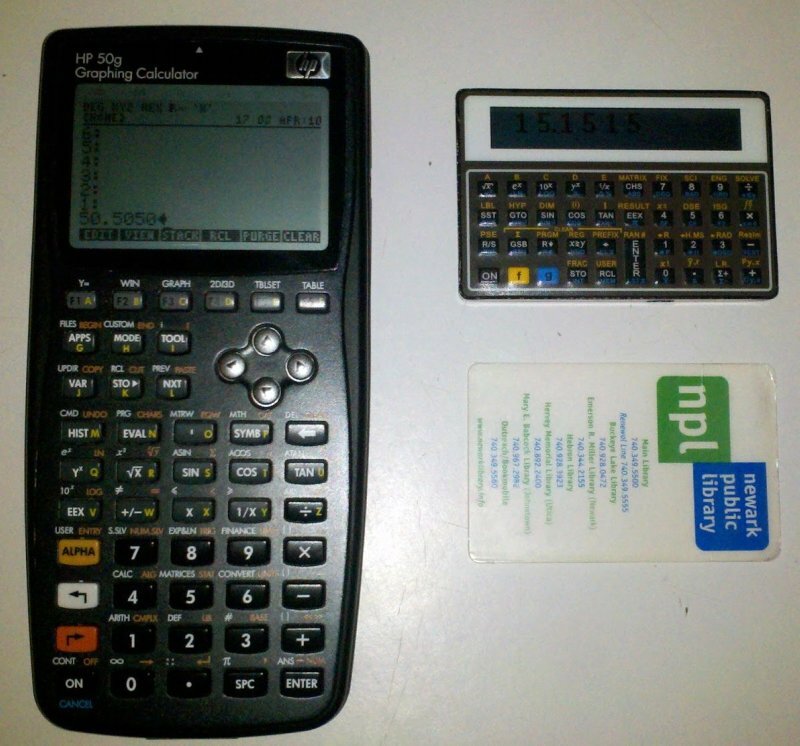 This is a method that Dave Jones discussed in EEVblog #130, about the µCalc, his own scientific credit card-sized calculator design. 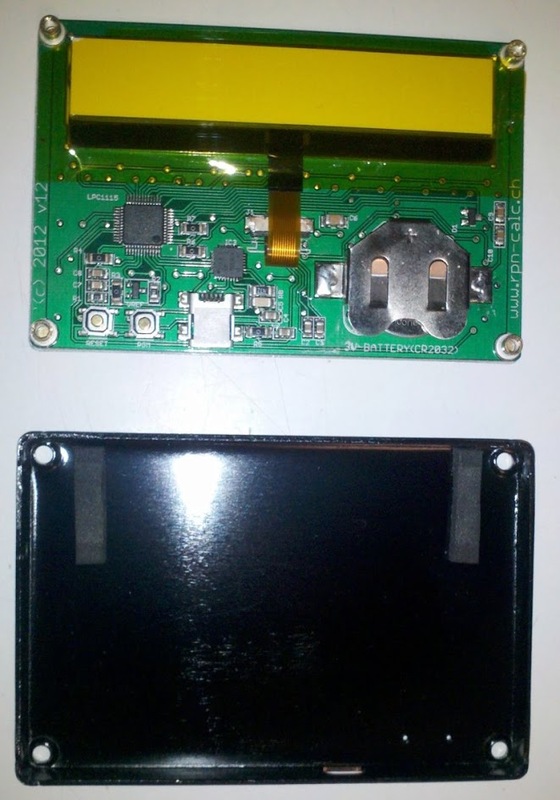 That said, the DM-15CC extended upon that idea by using a printed membrane front panel to look more professional, instead of using the PCB itself as the front panel, and it did not use the rear PCB for anything, unlike the µCalc. However, the unit that I received has switched to a different construction method. The front PCB, which carries the battery, LCD connector (with the LCD attached to the bottom of the PCB and viewable through a hole in the PCB), all electronics, and the keyboard snap domes, is still there, as is the membrane that covers the PCB, holds the snap domes in place, protects the LCD, and makes the front panel and keyboard buttons. The middle and rear PCBs are replaced by an aluminum case (with padding to support and protect the LCD), which serves as a much better looking case. Unfortunately, the edge of the aluminum is somewhat rough, negatively affecting the fit and finish of the calculator, but it still looks more professional than a PCB chassis. Also, SwissMicros chose to use a label to show the quick reference information from the back of the original HP 15C, rather than using the copper layer of a rear PCB, as they did on the early revisions. I’m told that Silver Edition calculators don’t have this label, though. Also, as I did get the leather flip case… it seems to be fairly decent quality, although it does have the slight annoyance that it makes the bottom row of keys a bit harder to hit. Well, we’ve opened it up, and I don’t like the slim font that it shipped with (and due to memory constraints, the DM-15 calculators can only hold one bitmap font at a time), so might as well reflash it. In fact, all of the photos here were shot with the thick font firmware already installed. SwissMicros provides instructions for doing the reflash on Windows, but my main OS is OS X, and while I could run a VM, the tools exist to do the flash on OS X. Once the flash is complete, press the RESET button on the calculator, and it should boot into the new firmware. Reassemble the calculator if disassembly was required. While this calculator does have some issues that need to be resolved, I’d generally say that I’m happy with my purchase, and definitely happy that it exists. I’m not sure I’d buy a second one, as I rarely actually NEED a calculator this small, but this is a nice novelty that’s highly useful. Display contrast – this is easily the second most important one. Unfortunately, I know that suitable displays are hard to find, but if another one comes available with better contrast and acceptable power consumption, an upgrade would be seriously nice for future models. Display contrast adjustment – this is just horrible, really. Not as important, because once it’s set, it can be ignored mostly. The 4 range alone covers the entire useful range of the display, and a better UI could just use ∑+ and 3 to jump 5 at a time, rather than change ranges. Lock out useless settings, and simplify the UI. Key debouncing – speed up the key delay (then again, HP’s actually had problems with this before, too *cough*49 series*cough*), and maybe fix the timing loop in the 12 MHz mode. Reduce the thickness of the flip case’s material – starting to get into nitpicking territory, but this might make it a little easier to access some of the keys with the calculator in the case. Fix the additional input annunciator for LBL – now we’re past the actually important issues, and well into nitpicking. But, it’d improve the UI’s consistency. Make firmware updates easier by enlarging the case holes – then again, I believe they’ve done this on the titanium case used in the DM-15 Silver Edition, so not the most valid complaint. And, really, I could fix it myself with a small drill bit. Provide a user-designed font tool – OK, that’s way into the wish list, and that’s why it’s on the end of the list. All in all, a nice calculator, despite its flaws. Update, 2013-08-11: Just thought I’d post an update, and mention that the input annunciator bug has been fixed in the V14 firmware. Also, the V14 firmware requires confirmation of LCD contrast setting changes, which reduces the risk of picking a bad setting. David mentioned to me that some users may find that their calculators need settings that I find useless on my calculator, so the entire range needs to be there, though. Check back for another update soon. And, I’ll go ahead and add an update to the review here in the comments. The flip case actually makes the keyboard much harder to use. Unfortunately, I don’t see a good way to do that design with the existing hardware. In other words, don’t waste your money on the flip case. The leather pouch might be much nicer, though (and I should have ordered it), although I’m using the neoprene pouch that the calculator shipped in now. Also, what COM Port should I select ? the DM15 is connected on the USB port. Can anyone confirm or deny if the keyboard ‘broke in’ over time and use? I have the DM41 pocket sized calc, and it definitely breaks in with use. Only took a couple of days to quiet down, but still takes a fair amount of force. TBH, I prefer the Voyager series-sized models for everyday use because the buttons are easier to work with. The CC-size models are nice for tossing in your pack for travel. Thanks for the review! You said you noticed some dust under the display and we’re able to fix it. Can you elaborate a little on how you got access to the space between the screen and top membrane? Some dust dislodged itself and appeared on mine too, and I’d like to get rid of it without destroying the calculator. The DM15 is wonderful. I have an original HP 15C and had an HP 15C limited edition. The DM15 is much faster than the original HP 15C. Of course, if you want speed, you use the emulator app for the iPhone sold by HP. (Looping program goes at 60,000 loops per second) The SOLVE function and integration are fast. Every time I use it I get a smile. I like the keys. I have reversed engineered a good part of the firmware and is looking into making a custom font and a few other minor changes. Especially the keyboard handling could be better IMHO. BTW: I have the large DM16C and I just LOVE it. I did reach out to swissmicros and asked if I could assist in the development but it seems like they were not interested.